I want to ride with you, travel through space and time with you. Husband and wife, singing and playing together. And they’re each deft instrumentalists, and they’ve spent years playing in others’ bands before coming together as a unit. They’re bound by music and an uncommon depth of companionship, they’re good enough to make Steve Earle swoon, and all of that sounds quite nice. “Yeah, we’re not exactly gazing lovingly at each other while we’re playing these songs,” says guitarist Chris Masterson. “Sometimes the ‘couple’ thing can seem a bit schmaltzy. We’re more a band than a duo, and we’re not going to be George and Tammy. We might not even be John and Exene.” That’s not to say that these folks don’t love each other, or that they aren’t of a piece. It’s just that listening to The Mastersons - either live or on their immediately engaging, musically expansive debut album, Birds Fly South (due out April 10 on New West Records) - isn’t akin to eavesdropping on two soulmates’ impossibly intimate conversation. This is more fun than that, with bright melodies that lead to dark lyrics, inventive harmonies and enough sparkle and twang to fashion a Porter Wagoner suit. Together, Whitmore (who plays guitar, violin, mandolin and most anything else with strings) and Masterson arrive at a singular blend that Emmylou Harris speaks of as “the third voice,” one distinct from its individual elements. To capture that sound, The Mastersons headed from their Brooklyn home back down to Texas, where they worked with a core group of close friends (Grammy-winning engineer Steve Chrisensen, bass man George Reiff and drummer Falcon Valdez) to co-produce Birds Fly South. To capture the harmonies, Whitmore and Masterson sang together, into one microphone. That didn’t mean the proceedings were free from arguments or eye- twitching. With the album complete, Whitmore and Masterson headed back to New York, and in May of 2011 they joined Earle’s group, The Dukes and Duchesses. Each night on the world tour, Earle moved aside to let his spotlight shine on The Mastersons, whose efforts were met with reviews like “scintillating” (London’s The Telegraph). Whitmore and Masterson remain integral players in Earle’s band. “Playing with Steve has been so great for us,” Masterson says. “We’ve both learned so much from working with other people. We’ve learned to have something succinct to say onstage and learned a whole lot about work ethic. And we’ve learned to handle so many many different scenarios.” The release of Birds Fly South should provide for some more of those scenarios, though The Mastersons aren’t making any predictions. “I’m not in the outcomes business,” says Masterson. He and Whitmore are more concerned with the action than the consequence, more about the offering than the reception. Eye-twitching or no, Birds Fly South is a lovely offering. 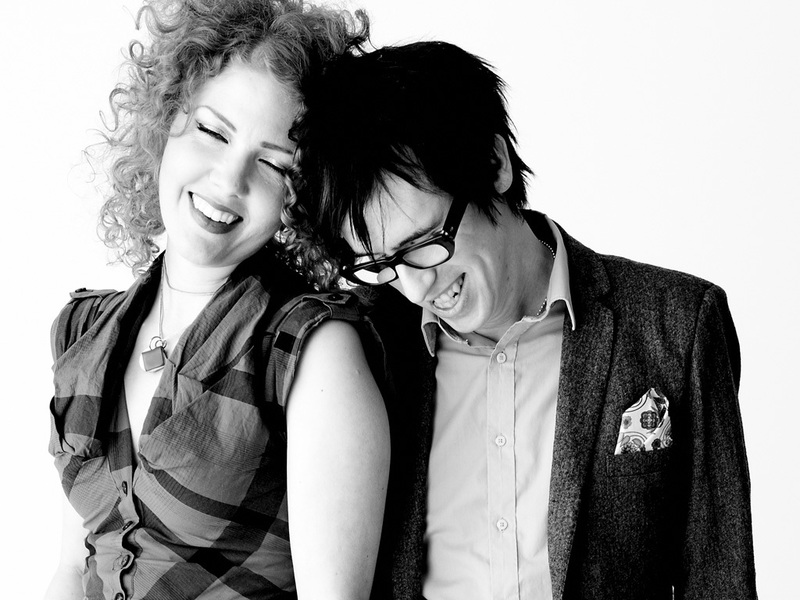 The Mastersons. Husband and wife, singing and playing together. And it sounds quite nice. Delightful, even.